What is their editorial policy? What are their submission policies? 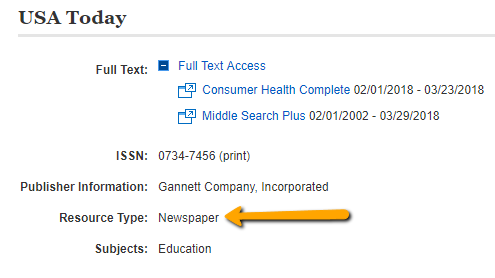 To access these, visit the library home page and select Journal Titles. Search for a journal title. You may see multiple versions with the same title if both online and print versions exist, or if the journal has changed publishers. Select the correct hyperlinked journal to distinguish if it is a peer-reviewed journal (or "refereed"), popular magazine, or newspaper. The publisher website for a particular journal has information about editorial and submission policies. 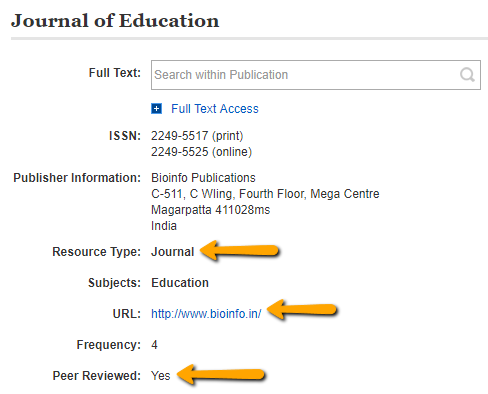 You can search Google for the journal title; the Ulrich's profile for a journal also provides the publisher's website. Submission information and editorial policies for a journal are usually not on the homepage. Look for About, Contact, Instructions to Authors, Author Guidelines, or Contribute links. For more guidance see I Need to Know If a Journal Is Significant in My Field.